The huts are exploding again! Another Filipino actionfest starring Romano Kristoff, Mike Monty and Gwendolyn Hung. When Mike’s daughter is lost in the jungles of Vietnam, along with some important documents, he sends his friend Peter (known as Ranger, at least in the German version) on a rescue mission. First, all goes according to plan, but then - no, I won’t spoil it for you, but it’s all not very surprising if you’ve seen movies like RAMBO 2 and the likes. I can be wrong, but it seems to me as if about 75% of this flick is action. Cheap, cheerful, fun action! Machine gun fire here, exploding grenades there, and bazooka action over there. If you’re a fan of guys jumping around and doing somersaults when grenades explode near them, then you’re in heaven. It’s neither realistic nor gory, but it’s immensly enjoying action schlock, exactly the kind the Philippines are famous for. 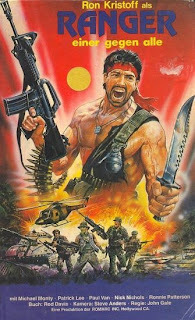 In the end Ranger goes into serious Rambo mode, complete with headband, pulls faces, screams maniacally, and shoots at all that moves (the cover artwork (minus the knife) should give you an idea). He even shoots down a helicopter - a rather ridiculous special effect I have to say. Directed by Jun "John Gale" Gallardo. To sum it up SLASH is a very entertaining slice of Filipino action, certainly not the best of its kind, but fans should have a great time with this one anyway. I am a fan and I sure did have a great time. Gwendolyn Hung is my cousin. She currently lives in the Phillipines and is a diver. I would like to find and buy this VHS movie, but can't seem to find it. Can anyone help? Plus the movie Slash(1984) and Warbus(1985). Thanks. Please email me at trash@trashvideo.com.au and I'll let you know how to obtain copies of these films. Also, please say hi to your cousin form me!